The competition attracted unprecedented numbers of spectators from the local community, with more than 1,500 people cheering on the contestants from the stands during what has become one of Qatar’s most popular events. Designed as the ultimate test of strength and endurance, competitors had to complete a number of intense challenges that included lifting cars, heavy weights and sand bags, flipping giant wheels and truck pulling. Commenting on the competition, Abdullah Al-Khater, Events Manager at Aspire Zone Foundation, said: "We’re thrilled to see such big turnout from the local community for this year’s competition. Its success during these past few years has been supported by Aspire Zone’s logistical capabilities and its growing popularity is a further testament to the fact that Aspire Zone offers something for everyone. Qatar’s Strongest Man is yet another success for Aspire Zone Foundation, which aims to promote sporting activities and encourage the public to maintain a healthier lifestyle by hosting year-round sporting events. We congratulate the winners and thank all participants and spectators for making this year’s event such a success." Hamad Al-Jaidah and Fahad Al-Maadid – both competing for the second-time this year – secured second and third place respectively in the Qatari nationals’ category. Other contestants in the Qatari nationals’ category included: Thamer Al Kuwari, Abdullah Al Mohannadi and Khamis Al-Khulaifi. Meanwhile in the expatriate category, Portuguese contestant Ricardo Ferreira finished in second place, with Egyptian contestant Mohammad Duwaidar finishing in third place. Other contestants included: Ahmed Ghassam (Syria), Haakon Miknas (Norway), Abraham Abonyo (Kenya), Meshack Ogola (Kenya), and Joseph Iroo (Kenya). Winners in both categories were awarded trophies by representatives from Aspire Zone Foundation comprising Mr. Abdullah Al Khater, Events Manager, Mr. Tariq Saeed Al-Abdullah, Venues Manager and Mr. Ali Hassan Al Mansouri, Head of Khalifa International Stadium. This year’s event was attended by a large number of local, regional and international media outlets, including nine broadcast channels along with representatives from a number of online and print media outlets, who were there to cover the event from its start at 3:00 pm until the awarding ceremony at 8:30 pm. Running alongside the competition, Aspire Zone Foundation organised a two-day series of community activities for all family members that included demonstrations of You.fo, an innovative sports game based on throwing an aerodynamic ring with a specially designed stick, and sports activities for kids including mini football matches and tug of war games. There were also a range of stalls selling food and souvenirs. Families attending the event thanked Aspire Zone Foundation for providing a series of activities year-round for all community members to enjoy. 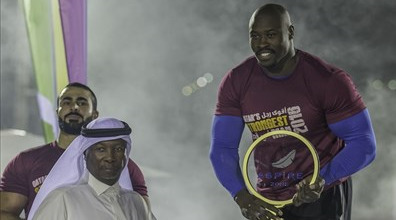 Now in its fourth year, Aspire Zone Foundation’s annual competition to find Qatar’s Strongest Man has drawn to a close with Qatari participant Fahad Al-Haddad crowned as champion in the Qatari nationals category for the second year running. In the expatriates’ category, Kenyan contestant Cristopher Oketch secured a well-deserved win after a remarkable show of strength in the truck pulling challenge.